If you think this sticker is bad, don’t read this rant. If you are going to do web development in rails on your local machine, you are going to need a development environment. This post will discuss using vagrant with virtualbox to provide a development environment suitable for the rails tutorial chapters. As the tutorial points out, installing rails can be a difficult task in and of itself. 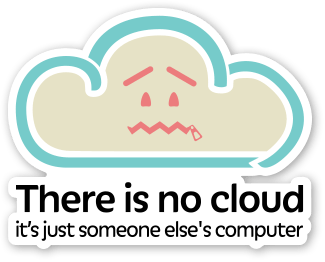 The tutorial recommends using a cloud IDE, but as you know, there is no cloud. Installing rails on your local machine can work for awhile but may become problematic in the future. If you have to work on other projects conflicts with different versions of development tools could arise. The other problem that you quickly run into is that any given installation tutorial or script becomes out of date soon after it is written. These instructions “work on my machine” as of 8/17/2015. I will assume that you have installed vagrant and virtual box. The exact method for installing each on your host computer varies depending on operating system. These instructions have been tested on both OS X and Ubuntu 14.04 during development. The complete instructions for installing rails 4.2.2 on top of Cent OS 6.6 are as follows. The real work of installing Cent OS and rails is done inside of the Vagrantfile that was downloaded during the git clone and the installation script. You can read below for an explanation of what is going on under the hood. I have chosen to use Cent OS 6.6 over Ubuntu during development because of its long term support schedule. I believe that Cent OS updates will be available further into the future than Ubuntu. The way vagrant works is by installing a base version of an operating system and then running a provisioning script. The provisioning script can be hosted remotely, in this case on github. All that is needed to install a rails development machine is to write a Vagrantfile and installation script. Or to find a suitable installation script hosted on a code repository. The Vagrantfile points to the installation script and uses it to “provision” or install software on top of the base operating system. The Vagrantfile will install a Cent OS 6.6 base box. I will go through the lines I added to the Vagrantfile below. This line installs the Cent OS 6.6 base box. This line points to the remotely hosted script that installs rails on top of the base box. This line does port forwarding of the default development rails web server port so that the web app can be accessed from the host machine at http://localhost:3000/. As you read the rails tutorial it will point you to the railsgirls website for installing rails. They provided an installation script for Fedora that would be suitable for installing rails on Cent OS. I had to modify the script, so I made a fork. I found that some of the steps were out of date. I also wanted to install specific versions of some software to be consistent with the versions used in the rails tutorial. In addition, I had to open a port in the default Cent OS firewall configuration to make it work in the vagrant environment. Here is a list of changes I had to make to the script. Get pgp keys before installing rvm and change location of rvm installation. Install ruby 2.2.1 as default. Open web server port 3000 for rails in the iptables firewall. If you run into problems mounting the /vagrant shared folder you may need to update your guest additions. There is a helpful vagrant plugin to do this. The beauty of this configuration is that it lets you use your editor of choice on the host machine. For example, in chapter 2 of the rails tutorial a toy_app is created. You can edit the files that are part of the app at the following directory location on the host machine. You can also treat the toy_app directory as a separate git repository. Files can be committed to git and pushed to a server from either the host or the guest machine. Vagrant automatically shares the root vagrant directory (where the Vagrantfile is located) with the guest in the /vagrant directory. You can run rails commands by using vagrant ssh from the following directory on the guest machine. Create your own vagrant base box. Open a port in iptables on CentOS.